Expect an action-packed fight night at Ringstar Boxing’s ‘Roar of Singapore IV - Night of Champions’ on April 20, which will be held at the Singapore Indoor Stadium. The back-to-back IBO and WBC event will also be the first professional boxing bout at the venue. 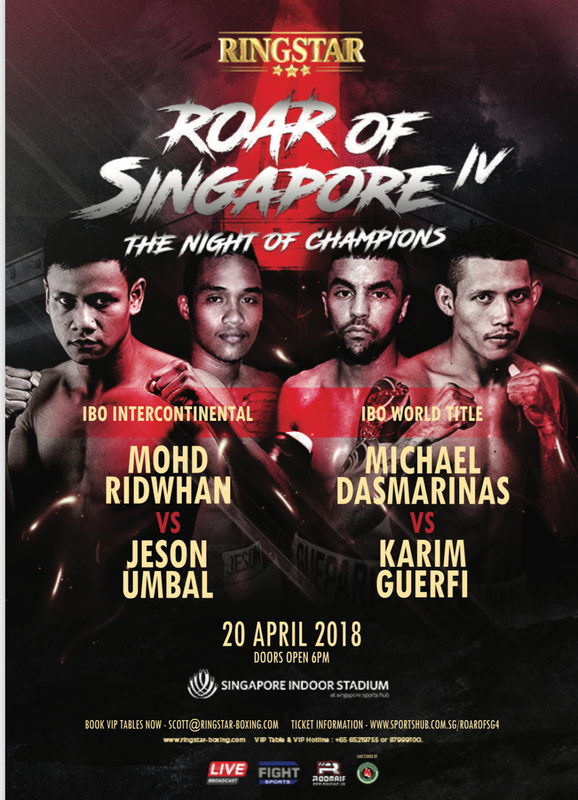 The ‘Night of Champions’ will have 3 main events, with unbeaten Singaporean boxer Muhamad “The Chosen Wan” Ridhwan (9-0), who will go against 23-year old Filipino boxer Jeson Umbal, currently ranked 8 places higher than Ridhwan in their IBO ranking. At stake is the vacant Intercontinental Featherweight title for both boxers. While another Filipino boxer, who is making waves in his country, Michael Dasmarinas will go against French boxer Karim Guerfi, at stake is an IBO world championship title. And finally, the last main event will witness Malaysia’s Mirage Kahn show his wares against New Zealander Chase “Hellboy” Haley, who will be defending his current IBO Oceania title, as they both challenge each other for the vacant WBC Asia Continental light heavyweight title. Tickets go live on February 10, 2018, with ticket prices for VVIP tables at SGD 5,000, with early bird rates at SGD 4,000, up to March 20, 2018. This includes a 4-course dinner with free-flowing wine and beer, VVIP gift bag which includes Ringstar shirts, corporate branding on the table, half-page ad in the fight program, exclusive VIP entrance and red-carpet access and photo opportunities with top celebrities and world-renowned athletes. While the VIP Ringside Seats are at SGD 288, with early bird rates of SGD 200 up to March 20, 2018. While Stadium Seating are at SGD 38, with early bird rates at SGD 20. Sponsors and Partners of ‘Night of Champions’ include Roomaif International, and Marina Bay Sands, which be the official venue for the pre-fight events, such as the press conference and the weigh-ins, also for the post-fight events.